Perhaps, in our concern for the ex-garden yesterday, we may have omitted confirmation of the fact that we are now, exactly as planned, in cruising mode. 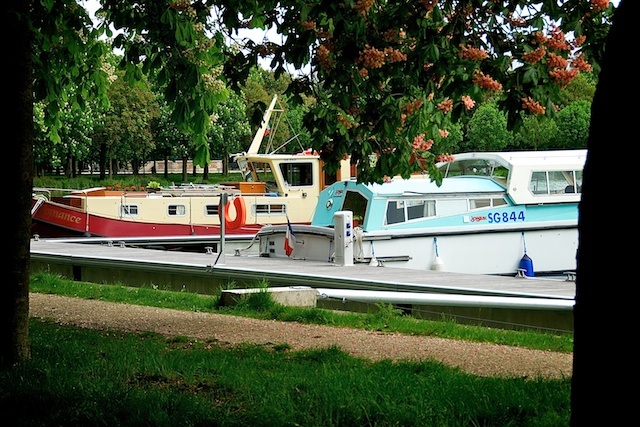 By now I should not have to repeat that cruising mode means making no plans, not caring about deadlines, getting up late or maybe very early, going to bed early or maybe very late, having cups of tea with the others in the harbour and so on, which is exactly how our day began, except that we thought we'd wander around Chalons for a bit in the misty rain as well, buying some carrots and bread and cheese and except for one of us mistakenly referring to the gentleman behind one of the counters as "madam", generally passing ourselves of as indigenies. Even when our morning coffee with Bob and Anna from next door turned into early afternoon, we weren't at all phased, in fact we were happy to be leaving in sunshine several hours later than we thought, after all we were only going to be travelling for a few hours, through four locks and we had all afternoon to do it. Leaving Chalons-en-Champaign after a very pleasant stay indeed, the brilliant young lock keeper "reminded" us that we couldn't actually move after four thirty today as the locks will be closed for the election. I am not quite sure what the deeper meaning of that no doubt symbolic closure is, but at a lesser level it did mean that on our first day of not making any plans, we had to change them. Ironically though when we had the opportunity to change them again just a little later, because of that very same closure we could not. We were not long out of our second lock of the day, with the clock ticking around four, the point of no return, when we could not but notice a pair of young ladies power walking with hiking poles and if I may say so, with a good deal of gusto to boot. Because of recent and hitherto unpublished news about a certain predicament one of my knees, we've taken to noticing people walking with poles, and we duly noted that this pair had clearly had a bit of practice. They seemed to recognise the flag flying from our bow as they approached at about double our speed, managed to have themselves understood by speaking with an accent that I suspect was from somewhere near Melbourne, in the process telling us that they were walking to Rome. Regretfully at the time we were in exactly the only circumstance that could have prevented us from giving them a lift back to Chalons, or for that matter even stopping for a proper chat. Netia and Jill, sorry, all the best with the rest of the trip, if you get up early (say round ten), and go down to the port, knock on Bob and Anna's door, they are going your way!